Be the badass at the grill rocking these delicious and adventurous bison skewers. At first, people may be put off that you are cooking bison instead of beef but one bite is all they need to change their minds. With all the flavor of beef with half the calories, it's the natural choice for healthy eaters. 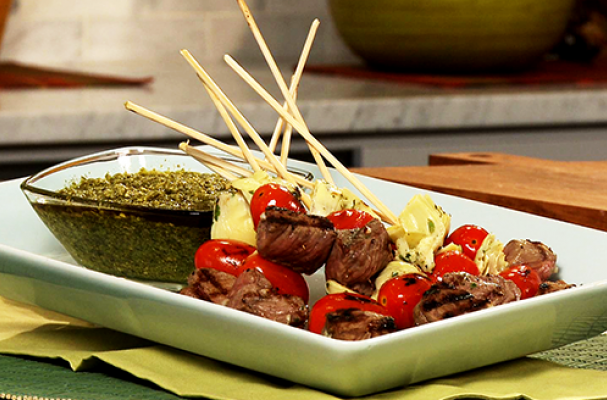 Marinated cubes of bison steak are skewered with tomatoes and artichoke before hitting the grill. They only need to cook for a couple of minutes before they are ready. Since bison has significantly less fat than beef, you want to cook it for a shorter period of time as to not dry out the meat. Serve these bison kebabs with a fragrant basil pesto. In a medium bowl whisk together the oil and vinegar until combined. Stir in the garlic. Trim the bison steaks and cut into ¾-inch cubes. Add the meat to the marinade and toss to coat. Marinate for up to 30 minutes at room temperature or up to 4 hours in the refrigerator. Remove the meat and discard the remaining marinade. Soak 24 6-inch bamboo skewers in water for 10 minutes; drain. Place one piece of artichoke about 2 inches from the point of each skewer, then add 1 tomato and then 1 piece of meat on the end of each skewer. Skewers may be made to this point up to a day ahead and stored in the refrigerator in an airtight container. To serve, arrange the skewers on a platter with a small bowl of pesto sauce for dipping.